Combat the Closing Techniques - The Fear CloseEliminate The Muda! Combating the Closing Techniques, a series, explores the tactics companies and salespeople use to separate us from our cash. For background, you may want to read the post that originated this concept, Marketing or Manipulation, featured on Financial Samurai. Our neighborhood is packed with trees. They are mostly pine, but there are a number of maple and oak trees as well as a smattering of ornamental plantings. You can imagine the work load each fall. Last year we had over 30 bags of leaves hauled off on two separate occasions. One of the few luxuries I afford myself is gutter cleaning. Two guys climb your roof with a leaf blower. While tied together, one supports the other while they dispatch the leaves in about 7 minutes! Last month during our nightly 30 minute call while I was traveling, my wife informs me she made a purchase decision that I wasn’t going to like. Of course when presented in that manner (I need to teach the wife to sell) I couldn’t help be be prepared, even predisposed to disliking what I was going to hear next. She paid $100 to have “some kind of boot replaced on the roof.” “What are gutter cleaners doing with boots on my roof?” I asked. 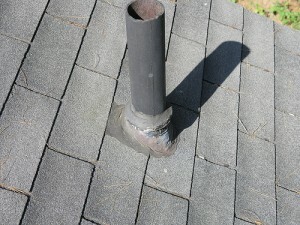 Around the base of vents through your roof there is usually some kind of flashing (boot) to prevent water leaks. On some roofs you will have a sheet metal, maybe even copper flange or you may have roof cement slopped around the base of the vent. Our highly trained leaf blowers it turns out also happen to be crossed trained as roof technicians and were so kind as to advise my wife that our ventilation boots have deteriorated. In such a condition, the risk of water leaks is significantly higher. Leaks in roofs are not only very expensive to fix but the subsequent mold growth was hazardous to our children’s health and potentially required specialized remediation. This real life event highlights one of the most (but not the worst) underhanded selling techniques. The Fear Close. We cannot fight back against the Fear Close unless we understand what is making us scared. With the exception of the decision to have emergency surgery or maybe if the roof is already leaking, few things must be decided in the moment. Waiting 24 hours, a week or even a month in most situations will make little difference in pricing and provide you time to explore your options. In our case, delaying the purchase decision would have provided time to determine if the boots really needed replacing, where they were located and if we could have done it ourselves. Saying no to an aggressive sales person is like keeping a cat away from catnip. This is one portion of our population that does not realize a no means no! If your sales person is trying such a manipulative approach; fight back with a little scare tactic of your own. Call them out on their poor salesmanship and put them on notice that you don’t appreciate their behavior. Request their supervisors name if they continue their approach. Do not buy, walk away. In sales speak, taking such a hard approach puts you in control. Unless you are up against a hardened professional, this sales person will not be pestering you with a follow-up call. However, If you do want their product, you now have your sales person ready to eat out of your hand. This just might be the best deal you have ever made. These posts have been chosen as one of their best post by the bloggers who submitted them, so check them out if you are looking to add more blogs to your reading list. Fear is definitely powerful mate. Fear of missing out definitely is one so many folks seem to use. Combating fear must come with your own knowledge, and self confidence. Need some advice after speaking to the AT&T tech rep. We bought our modem and router 6 years ago. The sales person said we need to change it up and buy the new stuff cuz we may lose everything and our stuff is ancient. Whatcha think? I do feel our internet is slow, and we have down times often now. Selling me fear, or the truth this time?! .-= Financial Samurai´s last blog ..Riding Rocketships For Greater Success =-. Samurai- 🙂 Self confidence… ah that too! Spot on good man, I figured I would let the psychologists deal with that one. It is all fear, if your provider wanted to keep you as a customer they would use the razor approach; provide the hardware for their network for a nominal monthly fee. Maybe it is time to shop the competition? I have a degree in network management and I know you will not lose any information if you your modem fails. You may lose connectivity for a while, but you won’t lose any data. You may get improved service if you have the latest technology, but that should be provided by the provider. Defeat fear by adding to your knowledge base. Now we all know what boots on a roof are and won’t be scared when our starts failing. .-= BibleDebt´s last blog ..Lower Your Bills: Free Wireless Phone Service =-. I actually had a doctor try this on me! He stood to gain some decent cash if I opted for surgery. He tried to argue that I’d need surgery on my foot ‘this week’ or else I wouldn’t be able to walk someday. The whole thing freaked me out, yet struck me as odd, so I saw another doctor. He told me that IF I ever found myself unable to walk, THAT’s when I should opt for surgery. That sounded a lot more sane to me–especially now that I’ve gone for 7 years being perfectly active. I never thought that I should view a doctor as a salesman, but I guess it happens. .-= Simple in France´s last blog ..Struggles with ‘Stuff’: Is it just me . . . =-. @Bible Debt – Thanks for the scoop! So you think they should use the razor method as well? Thanks for stopping in! @Simple – Doctors sell too. Who doesn’t? I am so happy that you opted for a second opinion! Ah, another great post on combating the closing techniques. Always good stuff. Using fear as a motivator to sell your product always struck me as particularly diabolical; great examples of ways to regain control. .-= Roger, the Amateur Financier´s last blog ..Lessons from NCECA and My Family =-. @ Roger – Thank you for the compliment! Sadly, it get’s much worse than just fear!